This was reposted from a talk group with permission from the original poster JMB. It looks like this may have been another case of a reloading mistake and a double charge or maybe a rifle primer. Again anytime you are reloading ammunition it is always better to double check than to double your charge. 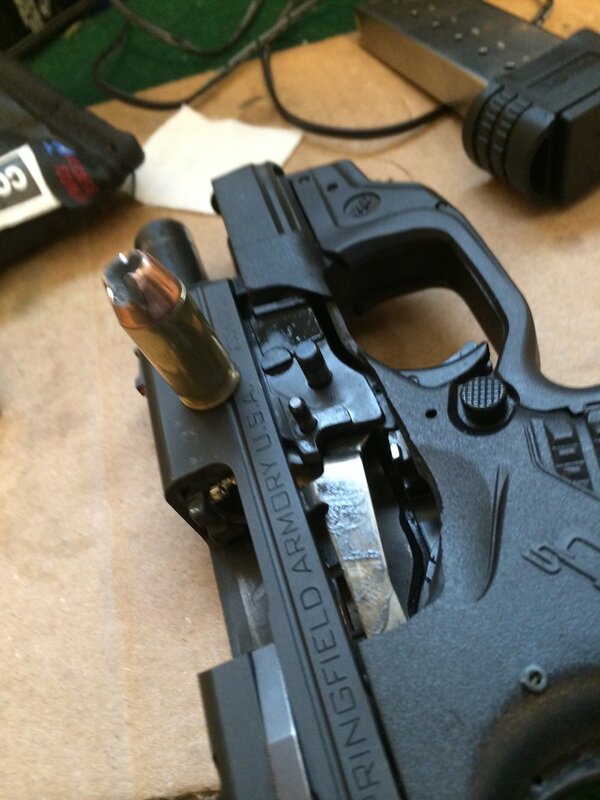 "I overloaded my handload of 231, best shot of the day from XDs 45. Take it at least once a week to practice drawing and double tap. Today it blew up in my hand. Beside the way extra recoil, blood blister, slight burn and shrapnel to my face, I'm great The bullet in the picture is the next one in the mag. BTW after 2 months when I got it back from SA recall it was better than before. I don't suppose this can happen from a heavy crimp?" I have been handloading for years. I was using new brass, which was very reflective, so I probably checked them being loaded but not quantity of load. I do both usually. I used Win. 231 5.4 gr.,Star Line brass and win. Lg. pistol primers, Hornady HAP hollow points 230gr. Measuring 1.230" loaded. Single stage RCBS press with Lee Loader 4 die 45 acp I contacted Gander Mountain where I purchased and got an extended warranty. They said they will mail it to SA for me. But that kind of smells bad buying an extended warranty just for their mail service. I think they should replace it. I have a Magnum Research Baby Eagle I bought through Davidson's Gun Genie, the extractor broke and they sent me a new gun after 2 years." 'I just finished pulling a bullet from the heaviest round I have left. Everything , brass, powder, and bullet checked out A ok. I did this at my work station and I noticed one of the primers is brass, others are silver. It could be I used a large rifle primer inadvertently. I threw that one away. Is it the reason for the failure?"